Bath Sports and Leisure Centre was officially opened on Wednesday 23rd January following the completion of a £10 million refurbishment, which has included a new trampoline park and a ten-pin bowling alley. 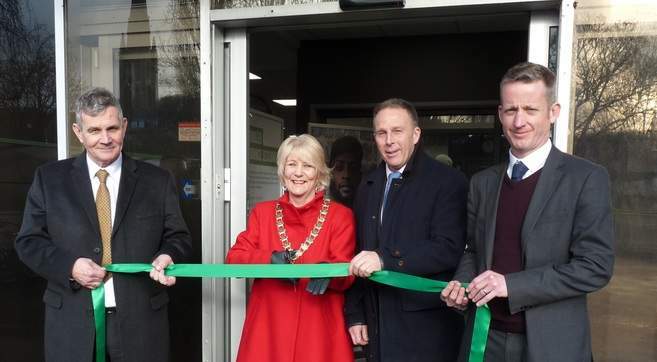 The centre was officially opened by Bath and North East Somerset Council Chair, Councillor Karen Walker, together with representatives from GLL and Sport England. Work started to transform the building in July 2016 after £1.5 million of funding was secured from the National Lottery, through a bid to the Inspired Facilities Fund which is administered by Sport England. Bath Sports and Leisure Centre was in need of updating and now residents and visitors have access to high quality sports and leisure facilities at the centre in North Parade Road. Councillor Bob Goodman, cabinet member for Development and Neighbourhoods, said: “A lot of investment has gone into providing a really great leisure centre which offers much more than most, with its new trampoline park and bowling alley as well as the pool refurbishment and enhanced fitness suite. Bath & North East Somerset Council has been working closely with Sport England to ensure the project suits its national aims of providing accessible leisure facilities that encourage people to live active lives. The approved scheme forms part of the council’s continued investment in improving leisure facilities across the district. Work has now started on the £11 million refurbishment of Keynsham Leisure Centre. This project is being delivered by the council through its chosen contractor Kier, in partnership with GLL and Sport England. Its aim is to motivate more people to get more active more often, especially families, young people, older people and those who are overweight and find ways to make physical activity more central to people’s lives.